Think you have no time for a healthy breakfast? You can make this delicious #beautyfood bite in just minutes: just whisk together the chia pudding ingredients, and allow it to set while you’re getting ready. Then layer it all into a mason jar, and you’ve got a skin-loving, creamy, sweet, #beautyfood breakfast-to-go! You can even peel and slice the kiwi the night before to simplify your morning. Chia seeds provide quality protein and fiber that stabilizes blood sugar, so you feel full without the bloat. These magic seeds also feed your skin with anti-aging omega 3 fats, vitamin E, zinc, and magnesium. Kiwi has high amounts of vitamin C to boost your immune system and build collagen. Pumpkin and sunflower seeds add crunch and so much more: mega-beauty vitamins and minerals like copper, zinc, manganese, B vitamins, vitamin E, and protein for all-day glow! In a medium bowl, whisk together the coconut milk, chia seeds, vanilla, coconut nectar, and lime juice and zest. Set in the refrigerator for 1 hour. It will be soft set. When ready, layer a few tablespoons of pudding into a mason jar, then add a layer of kiwi, seeds and coconut. Repeat layers until jar is full. #Beautyfood tip: Garnish with fresh mint and to add digestion and freshen your breath! MAKE THIS SKIN-LOVING TONIC, USE THE LEFTOVERS FOR A DIY MASQUE. Heading out for a day at the beach? Or maybe you’ve already spent a little too much time in the sun? For pre-and post-sun skin care, this #beautyfood tonic is a must-have! Matcha green tea powder acts as an effective UV barrier that also stimulates cell turnover while providing powerful antioxidant benefits. Cooling cucumber reduces hyperpigmentation, soothes sunburn, and provides natural electrolytes and beauty minerals. Coconut water adds mega-doses of much-needed hydration both inside and out to prepare you for the sun...or help you recover from it! Enjoy this delicious and refreshing #beautyfood tonic and masque to soothe, moisturize, and heal. #Beautyfood tip: Garnish with slices of fresh cucumber for even more cooling and beauty vitamins! Pour 1 tablespoon of leftover tonic into a small bowl and let cool. Add 1 teaspoon of Om Aroma & Co Raspberry Serum to thicken consistency and add sun protection benefits.. Remove with a warm washcloth & seal in the benefits with moisturizer mixed with several drops of Om Aroma & Co. Raspberry Serum. Add 1 teaspoon of Om Aroma & Co.Pumpkin Serum to thicken consistency and add anti-aging and moisturizing benefits. Remove with a warm washcloth & seal in the benefits with organic moisturizer. 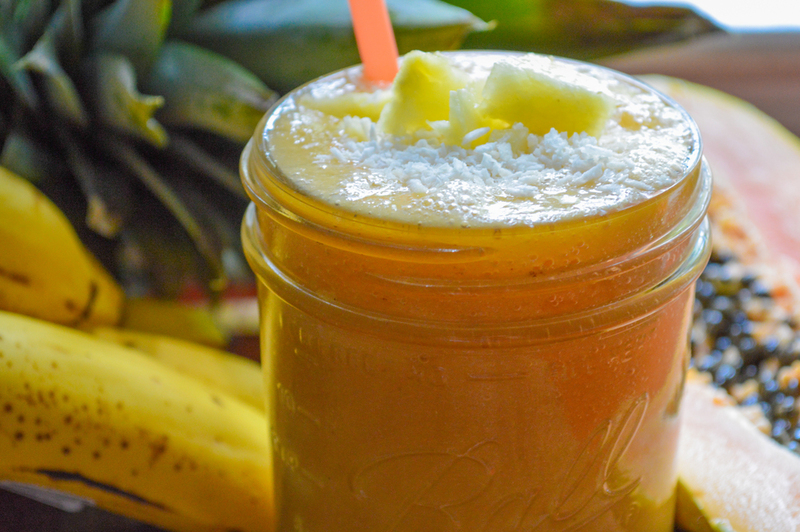 This weekend, whether you’re lounging poolside or working overtime, let this luscious #beautyfood smoothie take to away to a tropical paradise! The base of nutrient-rich coconut milk provides lauric acid - a medium-chain fatty acid that is easily absorbed by the body and used for energy - as well as adding beautifying moisture and elasticity to the skin with vitamins B, C, E, and copper. What’s more, we’ve added tropical fruit stars here to provide important enzymes. Papaya contains detoxifying papain which also serves as a digestive aid, while pineapple offers bromelain, which helps the body to synthesize collagen, firms skin, and fights acne. #Beautyfood tip: Garnish with finely chopped pineapple and unsweetened coconut for even firming and moisturizing! Pour 1 tablespoon of leftover latte into a small bowl and let cool. Add 1 teaspoon of Om Aroma & Co Manuka Honey Masque to thicken consistency and add exfoliating, softening benefits. Need a mid-afternoon boost to hit that deadline? Look no further than our go-to #beautyfood boost: the super-charged Power Protein Smoothie, packed with antioxidants, vitamins, minerals, and a double-shot of easily digested plant protein that your body can utilize instantly! Hemp seeds are an excellent protein source, but they also nourish skin both internally and externally with their high content of beauty fats in the form of gamma-linolenic acid, which provides an ideal balance of omega 3 and 6 fats. Chia seeds fight acne, hydrate, and prevent inflammation. Topically, they gently remove oil buildup and gently exfoliate without drying. And, if you’ve never tried a chocolate face masque, you’re in for a treat. Raw cacao smells amazing, feels decadent, and prevents premature aging to leave you with a radiant glow. #Beautyfood tip: Garnish with hemp seeds and goji berries for more beauty fats + antioxidants! Add 1 teaspoon of Om Aroma & Co. Rice Bran to thicken consistency and add exfoliating, anti-aging benefits. Getting your daily glow on is as elemental as water itself. With a few quick #beautyfood additions, you can create your own spa water (like the kind we serve our Savor Spa guests!) in minutes. Take fresh, organic produce, slice it or place it whole in spring water, let it steep while you commute, and sip it throughout the day. It’s that simple! Feel free to experiment with your favorite fruits and veggies, but be sure to try our top picks. Well known for high levels of vitamin C, citrus fruits are also rich in potassium, folate, and calcium, all essential to healthy skin by providing antioxidants, fiber, hydration, and tissue regeneration. Experiment with colorful flavor combinations of orange, lemon, lime, and grapefruit, and keep the rind on - that’s where the essential oils are. Cooling, refreshing cucumber contains vitamin C, as well as vitamin K, manganese, and beta-carotene, which provide skin with both acne and wrinkle-fighting benefits, tissue repair, UV protection, and collagen production. Cucumbers are also wonderfully hydrating, and add a smooth, clean flavor. This ancient spice is well-known for it’s immune-boosting and anti-inflammatory properties, but did you know it can help keep skin clear from the inside out? That’s right, the acne-fighting powers of turmeric are another reason to try a slice of this slightly bitter root in your water. Try combining it with one of the above #beautyfoods to enhance the flavor, or enjoy it alone. Peel this one first, slice thinly, and drink in the benefits! Which #beautywater combination is your favorite? Leave your thoughts in the comments below! Craving a healthy, flavorful, crowd-pleaser to bring to your next cookout or picnic? Try this #beautyfood hummus made from iron-rich black beans and age-fighting sweet potatoes: a light, filling, spicy-sweet comfort food packed with nutrients that nourish your whole body! enzymes. Sweet potatoes contain a mega dose of beta carotene, which helps us to produce vitamin A, a natural retinoid that fights wrinkles, fades hyperpigmentation, and smoothes the skin’s surface. Boil sweet potatoes for approximately 10-15 minutes, until tender. Drain, and let cool. Combine black beans and sweet potatoes in a food processor, and pulse until blended. Transfer to a large bowl, and add in cumin, chipotle, coriander, and sea salt. Serve with fresh organic veggies. Hot, sunny days are here! Staying cool and gorgeous is easy with this #beautyfood smoothie that hydrates and nourishes with a thirst-quenching blend of antioxidants and vitamins to keep your skin bright and radiant all summer long! Clarifying lavender and lemon team up with age-defying blueberries for a masque which tones, tightens, and moisturizes while soothing sun-damaged skin. Place all of the ingredients except blueberries and ½ teaspoon of lavender in a blender and blend at high speed for 1 minute, or until smooth. Pour into a glass ¾ full. Blend the blueberries and remaining lavender, then pour the mixture over the back of a spoon into the glass to separate the colors and flavors. #Beautyfood tip: Garnish with fresh blueberries for more age-defying antioxidants! Add 2 drops of Om Aroma & Co. Lavender Essential Oil to thicken consistency and add clarifying, anti-aging benefits. Remember PB+J sandwiches for lunch? Wouldn’t you just love a grown-up #beautyfood version, filled with healthy goodness to keep your skin gorgeous? We’ve got you covered. This #beautyfood smoothie feeds your childhood memories while fighting the signs of aging with protein, vitamins B, C + E, antioxidants, copper and magnesium. Try some as a masque for soothing eczema and psoriasis, as well as reducing fine lines, preventing wrinkles, and boosting collagen. #Beautyfood tip: Garnish with fresh raspberries for more age-defying antioxidants! This #beautyfood masque is easy to create. Add 1 teaspoon of Om Aroma & Co. Raspberry Protect Serum to thicken consistency and add hydrating, anti-aging benefits. Get your skin summer-ready with this #beautyfood smoothie that nourishes with powerful beauty minerals like copper and selenium, plumps with collagen-building Vitamin C, and naturally hydrates for a fresh, youthful glow! When applied as a masque, the nutrient-dense banana effectively firms and reduces the appearance of wrinkles, while helping to prevent new ones. #Beautyfood tip: Garnish with ground walnuts and unsweetened coconut for moisturizing + anti-aging beauty fats. Add 1 teaspoon of Om Aroma & Co. Manuka Honey Masque to thicken consistency and add exfoliating, softening benefits. Want a super-simple, light, fun #beautyfood bite that’s perfect for lunch, dinner, a snack, or even at a party? Wrap it up! Just gather a few colorful veggies and your favorite large leafy green, add in a tasty dipping sauce, and you’re ready to go! You can vary the veggies to your liking. Here, we’ve used detoxifying collard greens for the wraps, with their wrinkle-reducing phytonutrient lutein, but feel free to try with chard, leaf lettuce, or romaine leaves. The added zing comes from a zesty lemon tahini sauce, high in anti-aging B vitamins. Talk about Savor-y! In a small mixing bowl, whisk together the tahini paste with the lemon juice. *Note: If the tahini is not soft enough, warm it gently over a very low flame until it liquifies* Add the spring water gradually to desired consistency. Add in the thyme and sea salt, blend well, and set aside. Slice and julienne your vegetables, and set aside. Take one collard leaf, lay it flat on a cutting board, then slice in half at center, vertically. Remove stem. Layer vegetables across one half of the leaf, then roll away from you, as tightly as possible. Set aside, and repeat with remaining leaves. Scoop the tahini sauce into a small serving bowl, garnish with fresh mint, plate the collards, and enjoy! You can also cut the wraps each into 4-6 pieces, securing each piece with a toothpick to serve guests, #beautyfood style! Finally, a creamy, rich, satisfying #beautyfood latte to feed your skin and your soul! No caffeine here - we’ve swapped dehydrating coffee for the fabulous Dandy Blend herbal beverage for an antioxidant-rich drink that’s delicious hot or cold, day or night! Dandelion root has long been used as a highly effective liver and kidney cleanser, so it’s an excellent addition to your detox regimen, plus it boosts your immune system, is high in antioxidants, and acts as an anti-inflammatory. Blended here with cacao, you'll get a boost of radiance-nourishing B vitamins and beauty minerals, too. Place all of the ingredients in a blender and blend at high speed for 1 minute, or until smooth. For a hot latte, warm cashew milk on stovetop in a small saucepan half way to a simmer before blending. Do not boil. Serve immediately. #Beautyfood tip: Garnish with a dollop of coconut cream for anti-aging beauty fats. Add 1 teaspoon of Om Aroma & Co Rice Bran Exfoliant to thicken consistency and add exfoliating, softening benefits. Is there anything better than a lazy Sunday breakfast in bed? Make this too-easy #beautyfood bowl the night before, so when you wake up all you need to do is grab a spoon, your favorite book and a cup of tea and crawl back under the covers for some non-negotiable “me” time! This yummy, nourishing blend of complete, easily digestible chia protein and omega-rich flaxseed is light in your belly and amazing for your skin. The banana adds beauty vitamins A, B, C and E, plus serious antioxidants, all while adding a rich comfort food creaminess. So you’re feeding your skin while you relax! In a bowl, mash the banana well with a fork. Add in the chia, almond milk, flaxseed, cinnamon and vanilla, and whisk it all together until well blended. Chill in the refrigerator overnight. Om beauty tip: Garnish with chopped walnuts and raw coconut nectar for more age-delaying vitamins and minerals! With the changing seasons, the weather can be so unpredictable! One moment we’re basking in the sun, the next, bustling to escape the cold rain. This rollercoaster ride can wreak havoc on our immune system and our skin, but never fear - this #beautyfood smoothie, inspired by Om Aroma & Co.’s Raspberry Protect Serum, will come to the rescue every time! Show Mom your love and appreciation by baking her a batch of scrumptious #beautyfood shortbread! Just like its classic counterpart, this treat is light, buttery, and absolutely irresistible... but this one beautifies! The secret? Skin-saving coconut oil. It mimics the taste and texture of butter in bakery goodies while giving serious hydration from the inside out. The medium chain fatty acids also boost metabolism, allowing your body to use the fats as energy, rather than storing them. These bites are rich with subtle sweetness, a hint of warm vanilla and toasty almond. And they make such a pretty gift! Warm the coconut oil on a very low flame until completely melted. While it’s heating, whisk the flours and sugar together in a large mixing bowl. If you are using vanilla bean, split the pod and scrape the beans into the bowl. Pour the melted oil over the dry mixture evenly, then add extracts. Mix it as well as you can, then get in there with your hands until everything is evenly coated. The mixture will be a bit crumbly. Spoon the dough into an 11” x 7” baking pan. Press the dough down evenly with your fingers. Sprinkle the sliced almonds on top, and carefully press them into the dough. Score into 12 cookies, then bake for 18-20 minutes. Ovens vary, so keep an eye on them to ensure they don’t cook too quickly or burn. You want them just golden on the edges. Allow them to cool completely, then store them in an airtight tin. Give thanks this Earth Day with the farm-fresh, in-season ingredients featured in this bright and bold #beautyfood smoothie! The incredible color here comes from beets, which are high-level detoxifyers, and also provide an instant energy boost, making this a smart choice for your morning smoothie. Combined with luscious mango, you'll enjoy the digestive benefits of pectin and a flavor that’s uniquely fresh and sweetly satisfying! Used as a masque, beets fight wrinkles and reduce hyperpigmentation, while mango hydrates and moisturizes. Time to shine! Om Beauty Tip: Garnish with ground flaxseed meal and chopped green apples for an extra antioxidant boost! Add 1 tsp Om Aroma & Co. Rice Bran Exfoliant to thicken consistency and add brightening benefits to the masque. Good Morning, Gorgeous! Rise and shine with these super-yummy, #beautyfood treats packed with omega-3 fatty acids (which are essential to a healthy body and glowing skin!) and the anti-aging power of carrots, one of the star ingredients in Om Aroma & Co.’s Carrot Rose Glow serum. To create this #beautyfood version of a Spring favorite, we’ve swapped the oils, sugars, and flours found in traditional Morning Glory muffins for the skin-loving, enzyme-rich power of raw food, keeping all those important vitamins and minerals intact! Savor them at breakfast, as a mid-afternoon snack, or whenever you want a guilt-free sweet treat. Place all ingredients except shredded coconut into a food processor. Pulse until mixture is blended and begins to form into a dough-like consistency. Scrape sides with a spatula as needed. The mixture will be sticky. Transfer into a square or rectangular brownie pan (the square kind will make the bars thicker, so go with your personal preference!) and press down firmly until you have an even layer. Sprinkle the top with the shredded coconut, and press that down lightly with your fingertips. With a sharp knife, score into 12 bars, then put the pan into the freezer for an hour to set. Allow to thaw slightly before eating. Store leftovers into an airtight container in the fridge. Savor and share! Sweet organic blueberries are popping up in markets everywhere this week at great prices, so what better use than a #beautyfood smoothie bursting with juicy goodness to get you motivated? Blueberries contain one of the highest levels of age and disease-fighting antioxidants found in any fruit, which make them as important to your well-being as they are delicious! Here they are paired with another antioxidant star, sage leaf, plus the complete protein of chia seed to give your body energy and your skin a radiance that can only come from pure, natural ingredients! Om Beauty Tip: Sage leaf is also found in Om Aroma & Co.’s Raspberry Protect Serum for it’s amazing wrinkle-reducing and cell renewing properties. The season of detoxing is upon us! Time to rev up and revive our sleepy winter skin with an energizing #beautyfood smoothie inspired by our very own Om Aroma & Co. Pumpkin Renew Serum. This is a fantastic way to gently ease the body out of it’s overnight fasting, and begin your day with an invigorating blend that cleanses, revitalizes, and beautifies. The kale base provides a major dose of vitamins A, C, and K, but don’t worry - you’ll never taste it! The amazing flavor combination of lime and cilantro, blended with the sweetness of the apple make this oh-so-addictive! Om Beauty Tip: Garnish with additional pumpkin seeds for a tasty crunch, and even more beauty benefits! Add 1 tsp Om Aroma & Co. Pumpkin Renew Serum to thicken consistency and add anti-aging benefits to the masque. As Spring begins to awaken, our skin and bodies crave both gentle cleansing and active nourishment. What better way to welcome the season than with a gorgeous, colorful detox #beautyfood smoothie, packed with the skin-loving renewal of vitamin C, vitamin A, antioxidants, and minerals? The superstar ingredient here is papaya, which not only offers antioxidants, fiber, vitamin C and beauty minerals, but also contains the enzyme papain, which aids digestion and detoxifies. So get a jump on the season in the most delicious, beautifying way - from the inside out! Om beauty tip: Garnish with yummy goji berries and sunflower seeds for a powerful dose of antioxidants and vitamin A! With 2016 resolutions still going strong, we're noshing on low-glycemic gluten-free #beautyfood bites! These fibrous morning muffins are rich in manganese, vitamins A, C, K, and B to keep you glowing and energized all day long. Prepare them ahead for an easy on-the-go breakfast, or savor them over the weekend with coffee and snuggles (breakfast in bed, yes, please!) And don't forget to garnish with pumpkin seeds for an anti-oxidant boost. Pumpkin Seed oil is the star ingredient in Om Aroma & Co. Pumpkin Renew Serum for it's free-radical scavenging and anti-aging properties. We love ingredients that are good for you ON your body and IN your belly! Enjoy! 1. Preheat the oven to 350 degrees F. Grease muffin tin or line with parchment. 2. Mix flour, salt, baking powder, baking soda, and cinnamon. 3. In a separate medium bowl, whisk together the oil, coconut nectar, and egg. Add the dry ingredients and mix until just combined. Mix in the grated carrot, grated zucchini, and raisins. 4. Fill the muffin cups 3/4 full with the batter, garnish tops with pumpkin seeds and bake for 15 minutes, until golden. Cool for 5 minutes.